16 year old Hue receives a new pacemaker and healthy future! 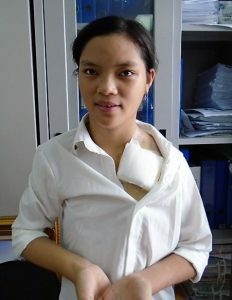 16 year old Tran Thi Hue has lived with a congenital heart defect all of her young life. Hue lives in rural Dien Chau District within Nghe An Province in Central Vietnam with her parents, who are farmers. Nghe An is rich in natural resources with large swaths of forests, coastline and minerals. But despite it’s beauty and economic potential, congenital illnesses are expensive for any family, especially physical laborers or farmers. Hue was lucky to receive a pacemaker when she was 8 years old to correct her heart defect, and has been able to live a fairly normal childhood since then! Hue looks much brighter after surgery! Recently the battery on Hue’s pacemaker has run out, and Hue’s family was faced with the difficult decision: find the money to replace the pacemaker or risk Hue being unable to finish school and have a healthy future due to her heart defect. 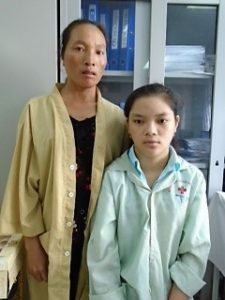 MEDRIX was able to cover part of the surgery expenses just in time for Hue’s surgery date, and our partnering organization OGCDC (Office for Genetic Counseling & Disabled Children in Hue, Vietnam) was able to support the remainder! Hue was discharged from the hospital on August 17th, 2017 in very good condition and health. She already looks much brighter and happier after surgery! Now she will be able to complete high school and hopefully continue to college–a feat that is nearly impossible with an untreated heart defect. We thank all MEDRIX donors for helping make surgeries like Hue’s possible and for providing hope and a healthy future for so many people in Vietnam!